While reading in the wonderfully straight forward and expansive view of creativity of the new book Creativity Unzipped, I find myself recalling a way I have helped friends not involved with integrative health to understand my attraction to the field. The groups of human beings pioneering the diverse professions that constitute the movement are best understood, I tell my friends, as colonies of artists. "I am a problem solver every time I paint," writes Ruth Westreich, the Creativity Unzipped co-author, fine artist and "accidental activist" in a section on how business needs creativity to succeed. So are nutritionists, integrative doctors, naturopathic physicians, holistic nurses, acupuncturists, herbalists, and others all day long. In their healthcare practices, they co-create, problem solve, and continuously evolve individualized care plans. They paint into the canvas of the lives in front of them. They live on the fulminating edge of what is new in their patients' lives and in the culture. They are typically entrepreneurs, running their own shops, frequently against the grain. Their focus is not on volume, but on a special kind of value: creating health. The traits of the integrative community evoked by the words of Westreich and her co-author Jan Phillips do not end there. Like the co-authors, this creativity takes activist dimensions. These practitioners started new schools and organizations, forming professional presence via licensing. Like most artists, the choice of profession was one that meant inhabiting an economically less secure neighborhood, parts of the three trillion industry where it can be difficult to find two dimes to rub together. Emotions and hopes run to extremes. Wonderful wild confidence can be followed by bouts of cascading yearning for a safer or more lucrative path. And like artists through all ages, they love to let their hair down and party! 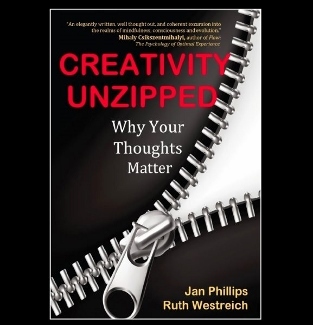 In Creativity Unzipped, Westreich and Phillips stimulate the creative juices of anyone who picks up the book. The "unzipping" is of our own minds. They seek to free readers from the constraints of our socialization that suggests "creativity" and identity as "artists" are limited to a special category of gifted souls. They strip away cultural baggage teaching that creativity and artistry are separate from ourselves. In a section called "Why Conscious Creativity is the New Activism," Phillips - an activist via her upbringing -- writes: "In a sense, we are all creators and activists whether we acknowledge it or not. We create stories all day long.Something happens an we make up a story about it to tell our friends." Out of the phenomena in our lives, we create new narratives. With these we can open vistas or wrap ourselves in constraints. The book's subheading speaks to this theme succinctly: Why Your Thoughts Matter. I think of my attraction to the integrative community knowing that Westreich is herself - while an "accidental activist" - an engine of such social creativity. Westreich is a colleague. Her creative imprint is on the healthy foods, palliative care, philanthropic, integrative health, consciousness in health, and other related communities. Projects with which I am involved have been beneficiaries of her special brand of creativity. One of Westreich's mediums, as the book illustratively describes, is the salon. At key moments, like an expert chef, she mixes just the right recipe of leaders in her living room to vault an initiative forward. The book's cover and initial pages include quotes from integrative leaders and authors like Wayne Jonas, MD and Mimi Guarneri, MD. The director of the Institute of Noetic Sciences Cassandra Vieten says: "When you get stuck, open this book to any page to find your creative WD-40." Like a stimulating gathering, the book, through its informal and conversational exchange between the two, creates a welcoming context to muse on one's own conscious and less-conscious creative impulses. Mightn't each of us, the book seems to ask, host the right conversation at the right time, in our home or in a neighborhood coffee shop or bar, between two or more who maybe did not know they could benefit from each other, to create just the right stew for change? In the course of the book's 225 pages, Phillips and Westreich explore multiple angles on their theme. The target audience is really every soul. They dive into creativity's role in personal growth and for opening self-limitations. 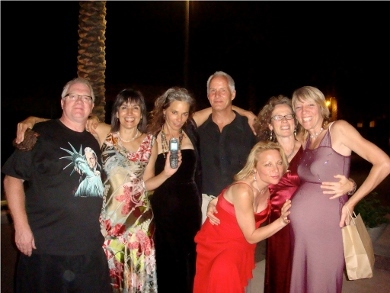 They examine applications in business and activism and delve into its relationship to mindfulness and spirituality. "Creativity," they write, "is spirituality in running shoes." Creativity Unzipped has special power in this moment in which what may feel unzipped is the fabric of our democracy, and in which the narrative that many of us are spinning is a depressive cocoon. It may be that we will all need a little WD-40 more often. This book is an aid for an upbeat response. Pick up the book. Open anywhere. Enjoy this salon for creators and activists.